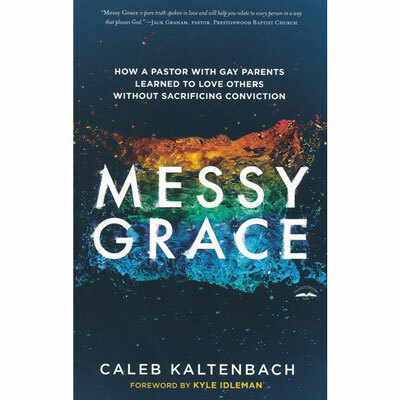 Caleb Kaltenbach was raised by LGBT parents, marched in gay pride parades as a youngster, and experienced firsthand the hatred and bitterness of some Christians toward his family. But then Caleb surprised everyone, including himself, by becoming a Christian…and a pastor. Messy Grace shows us that Jesus's command to "love your neighbor as yourself" doesn't have an exception clause for a gay "neighbor"—or for that matter, any other "neighbor" we might find it hard to relate to. Jesus was able to love these people and yet still hold on to his beliefs. So can you. Even when it's messy. Caleb Kaltenbach is lead pastor at Discovery Church, Simi Valley, CA. He speaks widely on faith, reconciliation, and sexual diversity to people on all sides of the LGBT issue. Caleb attended Talbot School of Theology (Biola University) and is currently finishing his DMin at Dallas Theological Seminary. He has been interviewed in numerous media outlets including The New York Times, Christianity Today, Fox News and the Glenn Beck Program. He and his wife, Amy, have two young children.